Othala is related to our ancestors, and things that are passed down from them: inheritance, property, household traditions, family and the connection with our lineage. This rune invites you to discover and embrace your heritage in all forms – from material to spiritual. Othala also draws our attention to physical and mental wealth, as well as the boundaries that exist around us. This rune is associated with Yggdrasil – the holy, mythical ash tree (the Tree of Life) in Norse mythology that connects nine worlds. It is the representation of heritage, material and spiritual wealth that we already have and can use to promote growth, development and prosperity. The rune of heritage sheds the light on property, homeland and family. It invites to pay attention to the inherited values that are present or could be present into your life if you crossed your personal boundaries to connect with your heritage. Othala also reminds to strengthen family ties, accept ourselves the way we are and accept our material, psychological, physiological, emotional and spiritual heritage. You can try hiding from your own inheritance, you can try to change, but you can’t go away from it because it’s a part of who you are. When you realize what you already have, you can use it to reach higher and do better. Don’t run away from who you are and what is given to you! When you don’t fight and deny what you already have, you can see it clearer and use it wisely to get where you want to be. Othala looks like a giant diamond ring. The type of thing one might inherit. Othala is responsible for wise management of available resources. Othala symbolizes our genetic inheritance, DNA, unconscious knowledge and spiritual power that comes from our ancestors. Othala helps to unite people and their stories in search for something greater. It doesn’t mean that this rune is a sign of need to dwell into past forgetting about the future. Othala invites to embrace what you have here and now, and move forwards to better future using what you have now, building strong, friendly community, taking care of your family ties and other forms of heritage. The rune of inheritance invites to pay attention to your living space, home, homeland, town or country, your property and family, your relatives, the community you live in – to people and material values you are related to. Othala tells that in search for better life, we have to use our inherited, sometimes unconscious knowledge and manage wisely the resources that are available to us. Act noble and you will be noble! 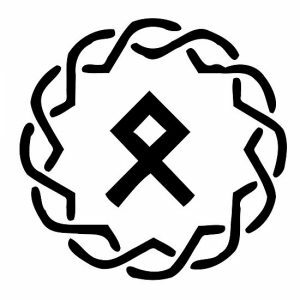 This rune speaks of family ties based on heritage. It reminds us to take a good care of our inherited relationships, and to renew and strengthen our family ties. Respect the relationships that you have in your life. Act nobly. Share your love and your respect with those who are a part of your community. Love and respect your relationships. Stay loyal to your family or your partner, and work on ensuring peaceful, harmonious family/community life. As Othala is related to inheritance, blood and DNA, it might show that your health issues are genetic. Pay attention to your genetics to prevent possible health issues that might occur in future. Search for ways to connect with your unconscious wisdom. The answers you are looking for are related to your ancestral knowledge. Connecting with ancestral spiritual power will lead to better quality of life and show you the way out of your troubles. Respect your inherited fundamental values and traditions and use the knowledge passed to you from your ancestors. Reversed Othala warns about wasting resources, foolishly spending or even neglecting what you have – from property and material values to relationships, your own talents and other inborn qualities that are used improperly, treated without respect or not used at all. This also reminds that arguing, fighting, injustice and being disrespectful to others leads to decay and collapse in any community – from small families to large communities. As Othala also draws the attention to mental and physical boundaries, reversed Othala invites to inspect the boundaries around you. Are you putting unnecessary boundaries around yourself, including prejudices and personal banishments? Are you treating physical and mental boundaries of others without violating their freedom? Are you oppressing your own freedom or the freedom of others? Use it in meditation, visualizing this symbol to connect with ancestral wisdom. Draw it on the borders of your property to protect it. Decorate your home or your altar with Othala to remind you of the values Othala stands for or bring harmonious family life. Wear jewelry, charms or pendants with Othala – use it as your talisman to acquire property. Include it into your family emblem, seal or stamp. Draw it in the air to protect your home, property and family.